Fit (Jacket): Semi-Fitted: Designed for 3 to 4 inches of ease between body and garment. Measures 3" - 4" larger than the fit-critical body measurement. Somewhat close to the body, but cut for ease of movement and fabric drape. Fit (Top): Loose-Fitting: Designed for 4 to 6 inches of ease between body and garment. Measures 4" - 6" larger than the fit-critical body measurement. 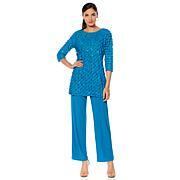 Generously sized for ease of movement and fabric drape. Original Slinky Brand Basic Tank For quick and easy solutions to your everyday fashion needs, look no further than Slinky. Enjoy a variety of stylish dresses and coordinates that mix and match to create incredible ensembles that are comfortable, easy-to-wear and perfect for any occasion.